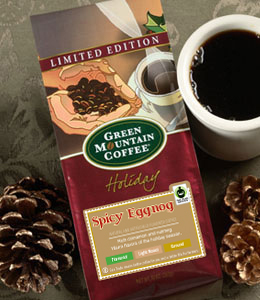 Green Mountain Coffee Fair Trade Certified coffee is available through specialty and mass retailers, grocery, club and convenience stores, offices, quick-serve restaurants and online. I am always impressed with their commitment to raising awareness of the importance of fair trade practices as well as the fact that they make great tasting coffee. 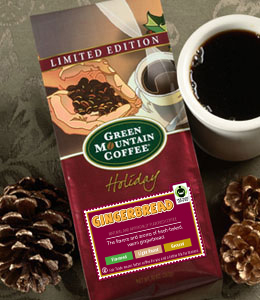 This holiday season, GMCR is offering two limited edition flavors: Spicy Eggnog and Gingerbread. Both are fair trade certified and available in bags or as K-Cups. I prefer darker roasts for a stronger coffee flavor, so I just brew two K-Cups on the small teacup setting to fill my mug. The aroma fills the kitchen and makes it truly feel like the holidays! I especially like the Spicy Eggnog flavor, since you get all the satisfaction of eggnog, with a caffeinated punch and no tummyache from drinking too much of the rich, sweet stuff. A welcome addition to the holiday entertaining arsenal. In accordance to the FTC Guidelines and the WOMMA Code of Ethics, I am disclosing that I received samples of the coffee to facilitate this review. All opinions are, as usual, entirely my own.